Sabaton, Children of Bodom, Slayer, Anthrax, Exodus… the list of bands that Lost Society has supported is quite impressive. This time, however, it was their turn to be the opening act when the Braindead Over the World 2016 tour came to Tavastia, Helsinki, on Thursday May 19th. Essi went over to see how the band’s Braindead revolution was going along. Blackpool’s gig photos are HERE! In February 2016, Lost Society released their latest album Braindead, which pretty much blew my mind away. The album showed that the band has developed a great deal and taken a step forward to an even heavier direction. Therefore, I was stoked see the band live after a long wait – the last time I saw Lost Society was in Nummirock 2015 if my memory serves me correctly. Since the new album really hit me, I couldn’t wait to hear how the new material sounded live and whether I would hear my favorite songs during the gig. 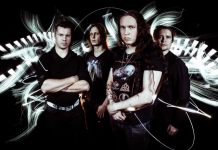 I had to wait for that information for a bit though, since the evening was opened by Inkvisitor, a thrash metal band from Lost Society’s hometown of Jyväskylä. I’ve gotta say, there must be something in the water up there! Tavastia had only a handful of people just before Inkvisitor started their gig but the band managed to draw the crowd up from their seats to hear their set. Founded in 2012, the band has had plenty of gigs already, which could be seen in their relaxed performance. Both the vocalist, Aapo Vuori, and the guitarist, Jesse Kämäräinen, interacted with the audience, the latter even coming down from the stage into the middle of the audience to play some tunes. As the set went on, the crowd grew larger and larger and I was not the only one tapping my feet on the floor. Even though I was not familiar with the band’s material, it did not bother me because the atmosphere was energetic enough to keep up my interest. After the gig I had the opportunity to have a quick chat with Aapo, who revealed that Inkivisitor will possibly be releasing their next album in the beginning of 2017. It’s going to be a long wait, but hopefully one that’s worthwhile. The next band on stage was Ratface, hailing from Helsinki and playing something that I would describe as a collision between Rytmihäiriö and Limp Bizkit. The band themselves apparently describe their music as saunacore, whatever that means. The best word to describe the act for me would be confusing. I was not sure (and still am not) whether the vocalist MC Respektor was singing in English or Finnish (or maybe both?). Thus there is not much I can say about the gig. I tried my best to be open-minded and enjoy it, but I’ll have to admit that saunacore apparently is not my thing. Instead I ended up looking at the time every 5 minutes in hopes of a short set. In Ratface’s defense, however, it must be said that the audience (at least the ones closest to the stage) seemed to really enjoy the gig… I just was not one of them. Luckily I got over my disappointment quite soon, as after a 30 minute wait, Lost Society was on stage. 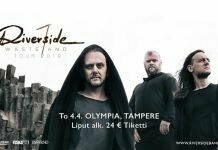 The band has grown nicely and it looked like their appeal as a headliner was enough for Tavastia. The size of the audience was just perfect – not too small for everyone to feel awkward, but not too big that you’d have to get in line just to queue for the bar. Tavastia is one of my favorite venues since the lights and the sounds seem to always (at least whenever I go there) be in order. As such, I can always focus on the main thing – the bands themselves – instead of being annoyed about bad sound or epileptic stage lights. Tavastia isn’t a legendary venue for nothing. After the first beats it was clear the band was on gear 5 (or 6 if you’re driving a sports model)! Lost Society started their gig with “Braindead,” followed by “Kill (Those Who Oppose Me),” and “Hollow Eyes” – all of which showed that the band was not messing around. With three strong albums, the band surely has a nice selection of great songs to choose from. What I love about Lost Society is that every time I see these guys performing there’s no doubt about whether or not they’ll be giving their all on stage. The music might be heavy and the lyrics somewhat grim but in between songs, there are four guys with wide smiles on their faces. Comparisons between Lost Society and Children of Bodom have undoubtedly been many, so I won’t be doing any this time. Also, it’s not the first time in the history of live music to have a band to include a guitar solo battle and a drum solo in their set, both of which I truly enjoyed on this particular occasion. My personal highlight from the gig was in the middle of the set when Lost Society performed “Only (My) Death is Certain,” which is my favorite from Braindead. Even though it’s perhaps a bit of a slower song compared to the band’s other material, this track screams attitude. I was happy to note that the song also works great live. Here’s hoping that it’ll stick around in the setlist as a regular at least for some time. Ending the set with encore songs “Fatal Anoxia” and “N.W.L.,” both from their previous album, Fast Loud Death, it was guaranteed that the audience left Tavastia sweaty and happy. Waking up the next morning with my neck and shoulders all jammed up, there was really no other option than to admit that I had been taken over by the Braindead revolution – and that I could not wait for the next time.